A cosmetic dentist is trained in the art of perfecting smiles. At Bedminster Family & Cosmetic Dentistry, we guide you on your journey to good oral health, and then make it possible for you to have a gorgeous and healthy smile. If you are unhappy with the appearance of your teeth – whether they are stained, discolored, chipped, broken, misaligned, gapped, cracked, or short – there is a cosmetic dentistry treatment that can eliminate the unsightly and create a better-looking you. There is no disputing that a well-done smile makeover created with cosmetic dentistry improves confidence. You will not only look like the best version of yourself, you can appear happier, healthier, younger, smarter, and even wealthier. It’s no wonder that porcelain veneers are one of the most in-demand cosmetic dentistry procedures. This smile makeover to the stars is responsible for megawatt grins and perfect teeth that look completely natural. Plus, veneers correct multiple aesthetic complaints at one time. Veneers are customized to each patient and sometimes all you need is one cosmetic dentistry procedure to conceal it all. Make short teeth longer, eliminate unappealing gaps, finally get straight teeth, and give yourself a smile that is always white and gleaming. You can try multiple over-the-counter methods, but if your teeth just don’t stay white or never get white enough, it’s time to see a pro. Your Bedminster cosmetic dentist can provide the most powerful bleaching agents to truly blast away stains and discoloration. Custom-made trays fit your teeth snugly and professional-grade whitening agents deliver permanent, beautiful, white results. Ever wish you had straight teeth but are reluctant to become a metal mouth? 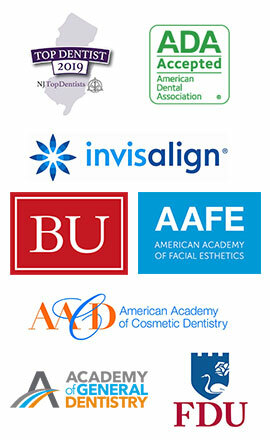 Invisalign is ideal for adults who want to align their teeth discreetly. Invisalign braces must be worn 20 to 22 hours a day, but they’re removable, so you can eat whatever you want with no restrictions. The patient’s responsibility is to follow the customized treatment plan designed specifically for you at the start of treatment. This includes changing nearly invisible aligners when indicated and keeping teeth and aligners clean. Diligent care and treatment will result in a straight, perfect smile, and no one will ever need to know that you’re wearing braces unless you want them to know. Patients who need small aesthetic improvements to their teeth will fall in love with dental bonding. 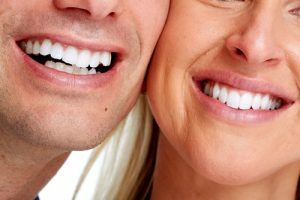 This fast, effective, and non-invasive technique can alter the color and shape of your teeth in one visit to your Bedminster cosmetic dentist. If you are unhappy with stains or discoloration, the composite bonding materials conceal the worst. Dental bonding is often used to replace old, unattractive silver fillings. Teeth can be recontoured, hiding misshapen and even chipped teeth. When you want a porcelain veneer-like smile makeover without the time or investment of that cosmetic dentistry procedure, there is the Snap-on Smile. This affordable option will last for about three to five years, which is long enough for some patients, but this is only a fraction of the time that veneers last. The smile itself is made of crystallized acetyl resin and is flexible enough to slip over your existing teeth. You can even eat while wearing the Snap-on Smile so you never have to worry about removing your enhancement and revealing your less-than-perfect teeth. If you have crooked, discolored, gapped, misshapen, or missing teeth, a Snap-On Smile can conceal imperfections and restore your confidence. No matter what kind of cosmetic dentistry you undergo or smile makeover you get, Dr. Mike Mavrostomos is hot happy until you are happy. Cosmetic dentistry is all about achieving your perception of beauty. Our Beautiful Smile Guarantee is in place so you trust that, no matter what procedures you undergo or how long it takes, you will walk away from our office with a smile you love. Each new smile begins with a design phase, which includes computer imaging and a diagnostic wax up. For example, with porcelain veneers, the tooth shape and shading are chosen to complement your facial type and coloring. These elements are determined at the start of the journey and temporary veneers are put in place so you can test them out in different settings and lighting and gather peoples’ reactions to your new smile. If you are dissatisfied with the appearance of your veneers at any point before the bonding process, we will start from the beginning – this is our beautiful smile guarantee. Contact Bedminster Family & Cosmetic Dentistry in Bedminster, NJ, to schedule a consultation with cosmetic dentist Dr. Mavrostomos and get on the road to a beautiful new smile.